It appears that many cow-calf producers have got to the point where they are starting to retain more heifers for replacement which is reflected somewhat in the feeder markets. The feeder calf and finish markets are at record highs, corn has decreased in cost considerably, which has many cattle producers optimistic about the future. Admittedly cost of production is very high but the costs of harvested feeds have moderated some which has helped in heifer development cost. The age-old question comes up as to what is the most economical way to replace cows in the herd. Is it cheaper to develop your own heifers, buy bred two-year-old heifers or cows that have had at least a calf or two? The answer often stated is "it depends," which is like a lot of my answers; it is correct and sound but of little value. I have maintained for years that if you are working hard on genetics and selecting and using at least some bulls with maternal traits in mind you should get your replacements from within your herd developed on your own resources. Of course, if you are using terminal cross bulls or bulls with poor maternal value then you will need to go out of the herd for replacements. It is argued that purchasing heifers increases your disease potential plus you are often buying what the person producing the heifers didn't want but with good management and a long-term relationship with the heifer supplier that is not necessarily true. I have had it argued that in some areas of the intermountain region they don't have enough high-quality feed to produce their own heifers but with recent research out of the University of Nebraska, initially by Dr. Gene Duetcher, and carried on with extensive research by Dr. Rick Funston and coworkers, that has proven to not be a very strong reason in my opinion. If you have the feed resources to get cows bred back, then feed resources are probably good enough to adequately develop heifers that will breed at 15 months. A very small amount of extra protein supplement may need to be purchased in some operations. As the producers get a little longer in tooth some prefer not to have the hassle of calving 2-year-old heifers so purchase 3-5-year-olds often from a total dispersions which makes it more problematic getting cows to fit your herd. The University of Nebraska Agriculture Economics Department annually estimates the cost of various livestock and crop enterprises. A group puts together their best guess of costs for all inputs and ultimately comes to a "bottom line" figure. Some exclaim that their estimates are too high as they include all costs, including ownership costs, so they have designed spreadsheets so you can enter values that you feel fit your operation. I modified their spread sheet to reflect what I felt would be pretty close for many operations and found a bottom line for cost of a bred replacement heifer to be $1,628 per head. That included $1,000 for the weaned heifer calf so development costs for 17 months was $628 (that included $138 credit for cull heifers). It is doubtful that you can find a string of quality-bred heifers for $1,600-$1,700 today. Who knows what it will be a year from now but with current conditions I don't see it dropping unless we see some catastrophic event such as widespread drought. Funston and his co-workers have felt we need to challenge the developing costs by keeping our development at lighter weights by utilizing grazed forages or crop residues to decrease feed costs which is the major cost of development. They have had very good breed-up results when the heifers are bred at close to 55 percent of their expected mature weight. Those that continue to develop heifers to 65 percent of expected body weight are paying for fairly high cost insurance in development. Adam Summers, graduate student of Dr. Funston and others recently published a paper in the 2013 Nebraska Beef Report where they compared development of heifers almost exclusively on corn stalks and wither range versus a group that was started on native pasture but then finished developing them in a dry lot. The corn stalk heifers weighed 692 pounds at breeding versus the heifers in dry lot at 770 pounds, a 78 pound difference. As with many other of UNL studies there were no differences with AI synch breed-up or total pregnancy rate (69 versus 63 and 93 versus 91 for the cow stalk versus drylot heifers respectively). The interesting thing about this study is they measured feed efficiency of the pregnant 2-year-olds after summer grazing and found that when offered hay and supplement free choice those heifers developed slower on cornstalks were slightly less efficient in feed conversion. Apparently this previous experience in drylot provided a slight advantage when fed in confinement at a later date. Another learned experience carried over a year later in a different study that grazed heifers on corn stalks while being developed as yearlings. 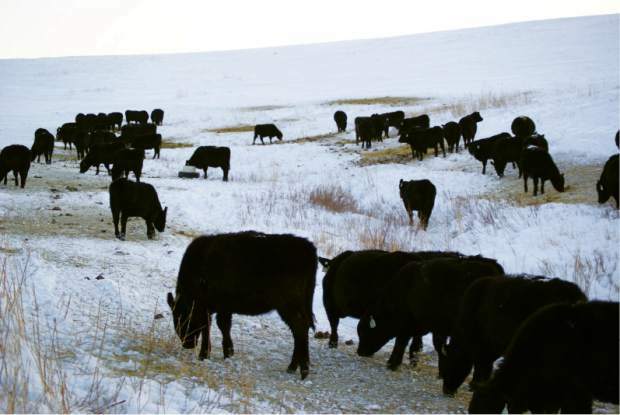 After they weaned their first calf they were wintered on corn stalks along with a comparable group of heifers that were developed primarily on winter range. They found that the heifers developed on stalks gained more the second winter than those that were developed on winter range. Again, suggesting that heifers may perform better if they are developed in a like environment that they will find when entering the herd. The bottom line is that in these times of very high costs of harvested feeds it behooves all of us to find the most economical way to develop heifers. Research says we do not need to have them fleshy weighing 65 percent or greater of their mature weight and the lower breeding weights can be achieved primarily on grazed forages or crop residues. My heart and prayers go out to those that have had to face devastating losses. I know you did all that you could have possibly done and yet know the heartache, let alone the economic loss has to be horrible. Again, our support and prayers are with you.